The complex offers comprehensive facilities for learning in an electronic environment with fully wired classrooms, a virtual reality lab, an advanced graphic lab, a lighting lab, electrical engineering and computer labs, a photography studio, and TV production and broadcasting studios with double-height ceilings. It also offers galleries and lecture rooms, an office of the future, a resource center with a 15,000-volume library, conference rooms and office spaces. 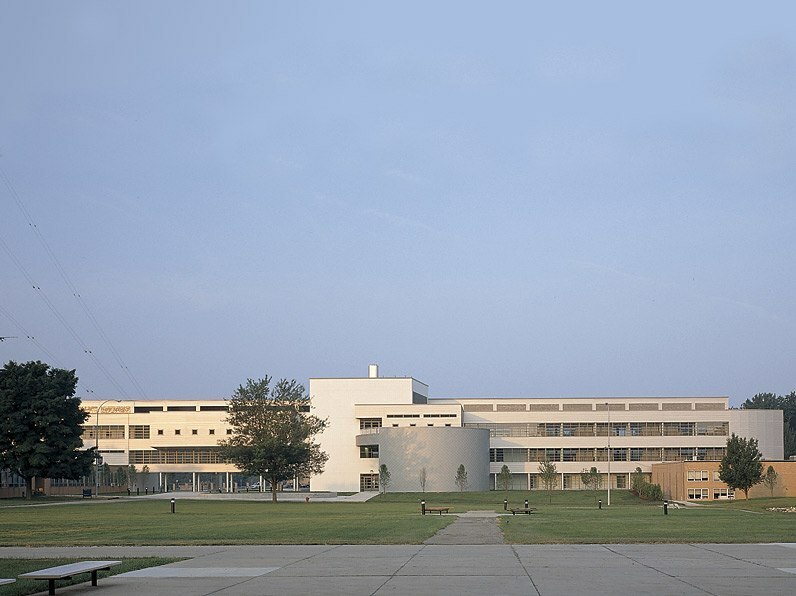 The four-story, 135,000-square-foot building extends between the one-story Architecture and Engineering Buildings, its length interrupted by a grand three-story portal that acts as the school’s formal entrance and leads to the campus quadrangle. The ground floor lobby announces the building’s focus on technology with an information commons featuring computer stations available for campus information, group teaching and individual research. White ceramic tile has been used to clad the facade’s base, with ribbed steel panels painted metallic silver for siding. Zinc shingles were selected to clad the special facilities that extend from the exterior walls as rectangular objects. The initial analysis of the building site also resulted in a complete reconsideration of the campus plan. Formerly, the main road to the campus continued through the middle of the central campus quadrangle, impeding pedestrian flow among the main academic buildings. The road now circles the campus perimeter, and the parking lot previously on the site has been relocated to an edge of the campus. The result is a pedestrian quadrangle, with the Technology and Learning Complex completing its architectural frame. A new landscape plan features tree-lined paths connecting the buildings that border the quadrangle.